I lived all over the place as a kid. My father was interested in experiencing the world and my mother, two sisters and I were along for the ride. We travelled around Europe in a Volkswagon van, camping on the sides of rivers with gypsies; bounced around the U.S. from Alaska to California to Texas; and spent several years along the Baja California Peninsula in Mexico. In Baja we lived on the beach, spearfishing our dinner daily and spending a lot of time in and around the ocean. My sisters and I were home-schooled for a lot of our younger years, but moved back to the U.S. (SF Bay Area) permanently for high school and university. After earning a B.A. in Environmental Studies from California State University East Bay in 2001, I decided to take some time and develop my skills working in the field of ecology. Particularly interested in marine biology and conservation and fluent in English and Spanish, I became involved in several internships and jobs throughout Latin America, where I discovered my passion for studying and conserving sea turtles. 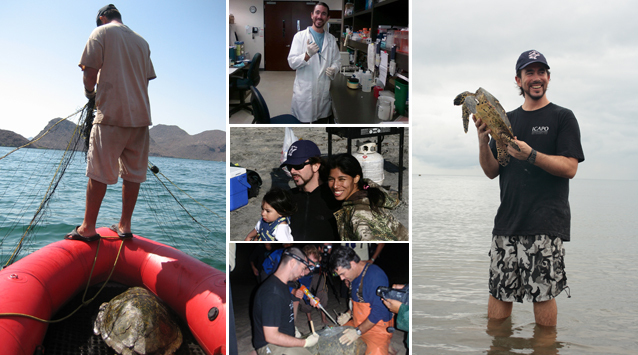 After gaining invaluable experience with organizations such as the Sea Turtle Conservancy, Charles Darwin Foundation, PRETOMA and ProCaguama , I reached a point in my life where it was necessary to advance myself academically and enhance my conservation actions with the quantitative skills and theoretical foundation that I could only gain by attending graduate school. To meet this goal I returned to California and attained a Master’s Degree in Biology at San Diego State University (SDSU) in 2011 and a Ph.D. in Ecology through the Joint Doctoral Program in Ecology at SDSU & UC Davis in 2017. As recently as 2007 hawksbill marine turtles (Eretmochelys imbricata) were thought to have been functionally extirpated in the eastern Pacific Ocean. However, with the support of various colleagues, in 2008 my wife Ingrid and I founded the Eastern Pacific Hawksbill Initiative (ICAPO for its acronym in Spanish), an international network aimed at researching and conserving hawksbill turtles in this region of the world. In conjunction with various local partners we identified several important nesting and foraging rookeries, findings which vastly improved the conservation outlook for the species, while also presenting new opportunities for research, conservation and management (see Gaos et al. 2010 below). Despite the encouraging findings, <700 reproductively active female hawksbills have been documented nesting annually along the approximately 15,000 km of eastern Pacific coastline, highlighting the precarious state of the species in the region. Cited as a top conservation priority, my Master's research focused on understanding movement behavior and habitat use of hawksbills in the eastern Pacific, which I investigated by equipping fifteen adult hawksbills with satellite tags in Mexico, El Salvador, Nicaragua and Ecuador. The overall goals of the study were to aid management strategies and conservation efforts, while gaining further insight into the ecology of the species. Click HERE to watch a video of the hawksbill tagging activities in Estero Padre Ramos, Nicaragua. My Master's research led to the identification of several key hawksbill aggregation areas, while also revealing a new life-history paradigm for the species (see links to publications below for more information). Despite the encouraging findings, our understanding of hawksbills in the eastern Pacific remained limited and fundamental information on stock structure, genetic diversity and population connectivity were lacking. My PhD research addressed these important information gaps via genetic molecular assays of hawksbills in the region. By integrating the information generated via this research with ongoing satellite telemetry data, I greatly expanded our understanding of this endangered sea turtle population. For more information on the ICAPO network and its partners please visit www.hawksbill.org. Special thanks to the Southwest Fisheries Science Center (NOAA), Grupo Tortuguero, Equilibrio Azul and Fauna & Flora International - Nicaragua for their instrumental work on this initiative, as well as all the other ICAPO partners. I'd also like to acknowledge the National Fish and Wildlife Foundation, US Fish and Wildlife Service, International Sustainable Seafood Foundation, US Agency for International Development and Southwest Fisheries Science Center (NOAA) for their critical and ongoing support of ICAPO. Gaos, A. R., Lewison, R. L., Liles, M. J., Gadea, V., Altamirano, E., et al. (2016). Hawksbill turtle terra incognita: conservation genetics of eastern Pacific rookeries. Ecology and Evolution, 6(4), 1251–1264. http://doi.org/10.1002/ece3.1897. Gaos, A.R. and I. Yañez. 2012. Saving the Eastern Pacific Hawksbill from Extinction: Last Chance or Chance Lost. In: Seminoff, J.A. & B.P. Wallace (Eds.). Sea Turtles of the Eastern Pacific Ocean. University of Arizona Press.